If fintech licensing is a race, then Lithuania is definitely ahead of the pack. 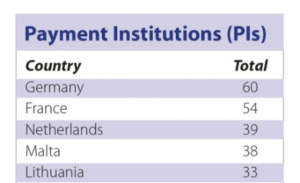 According to data gathered from regulatory bodies of different European countries, the relatively small Baltic country is second only to Britain when it comes to Electronic Money Institution (EMI) licenses and it isn’t that far behind when it comes to Payments Institution (PI) licenses. Data shows that Lithuania has a total of 39 full EMI licenses and 33 PI licenses. The eyes of the financial technology industry have been set on Lithuania for quite some time, and this attention has only intensified after Revolut was granted both an EMI and a Specialised Bank license, which allows the aspiring “Amazon of Banking” to receive deposits and issue credits. The key success factor that was instrumental in Lithuania’s progress in this field has undoubtedly been the initiative and leadership of the Bank of Lithuania, which has guaranteed transparent and effective regulatory environment. If in other European countries the regulator often plays the part of an overseer or a watchdog, the Bank of Lithuania lends a helping hand to newcomers out and is always improving procedures that take several times longer elsewhere.